Madrid’s City Hall have introduced new restrictions on traffic in the heart of capital. 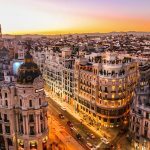 From November 30th, the centre of Madrid will introduce new restrictions on traffic, limiting access to a newly created zone called Madrid Central. Only certain private vehicles will be allowed in the restricted area, under a controversial plan aimed at lowering pollution in the city, reducing traffic and boosting the circulation of public transport. The changes will be applied progressively, but the plan has already created controversy and opponents have launched legal measures to try and stop it. Madrid Central is a designated low pollution zone that will come into effect on November 30th. 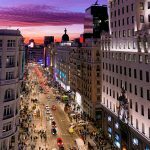 It is part of the City Hall’s Plan A for Air Quality and Climate Change, and it will limit private traffic in the centre of Madrid and change the way people move around the city. The main goal is to reduce the pollution in the centre, which is already above the limits set by European legislation. It also aims to reduce noise pollution and prioritize pedestrians, bicycles and public transport. What are the limits of Madrid Central? 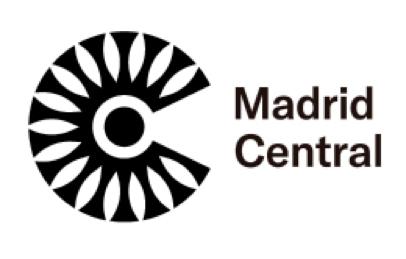 The Madrid Central zone will include almost the whole district of Madrid Centro (Palacio, Embajadores, Cortes, Justicia, Universidad and Sol) and it will include the four APR (Áreas de Prioridad Residencial: residential priority areas) that already exist in Madrid (Letras, Cortes, Embajadores and Opera) adding two more: Universidad (Malasaña) and Justicia. The total area will encompass 472 hectares (1166 acres). 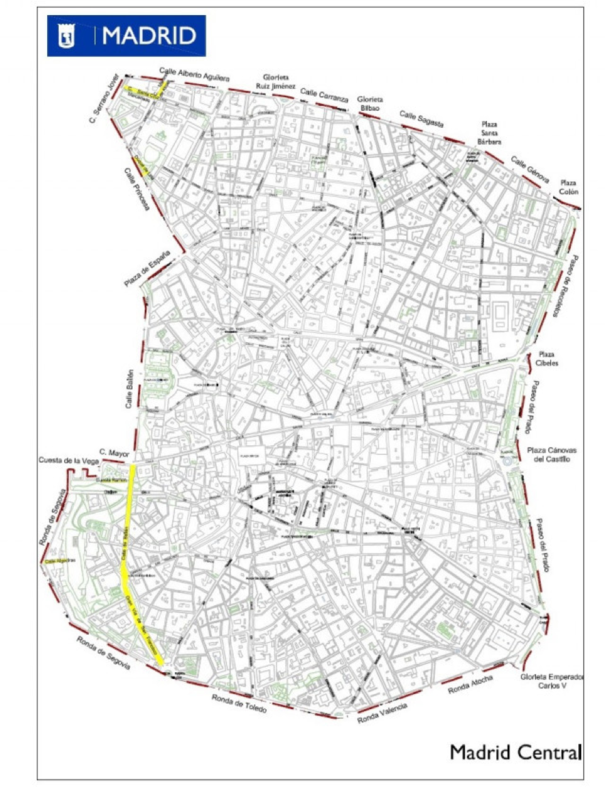 The limits will be easily recognisable, using the main streets and boulevards that surround the centre (Ronda de Toledo, Ronda de Valencia, Ronda de Atocha, Paseo del Prado, Paseo de la Castellana, Calle Génova, Calle Alberto Aguilera, Calle Princesa, Plaza de España, Calle Bailén and Ronda de Segovia, among others). In these streets, traffic will be unrestricted. The DGT (Dirección General de Tráfico – General Direction of Traffic) introduced environmental labelling for cars in 2016 which classified vehicles depending on their environmental impact. This was designed to make it easier for authorities to restrict the worst polluting traffic during environmental alerts. The labels will now determine who can access Madrid Central and how. It affects diesel cars made before 2006 and petrol vehicles made before 2000, as well as motorcycles made before 2003. Depending on its pollution level, a vehicle can be labeled, from more to less environmentally friendly, as 0, Eco, C, B. Those cars not eligible for a sticker are classified as A. Check the DGT website to find out the classification of your vehicle just by introducing the license plate number. During periods of environmental alerts city authorities will ban cars with higher emissions from driving into the city – that’s when these stickers become important. Who can drive in Madrid Central? 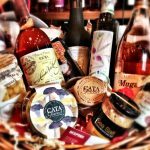 Those resident in the Madrid Central zone (who are registered on the padron) will be allowed to enter with their cars. Other exemptions include people with reduced mobility who display a disabled badge. 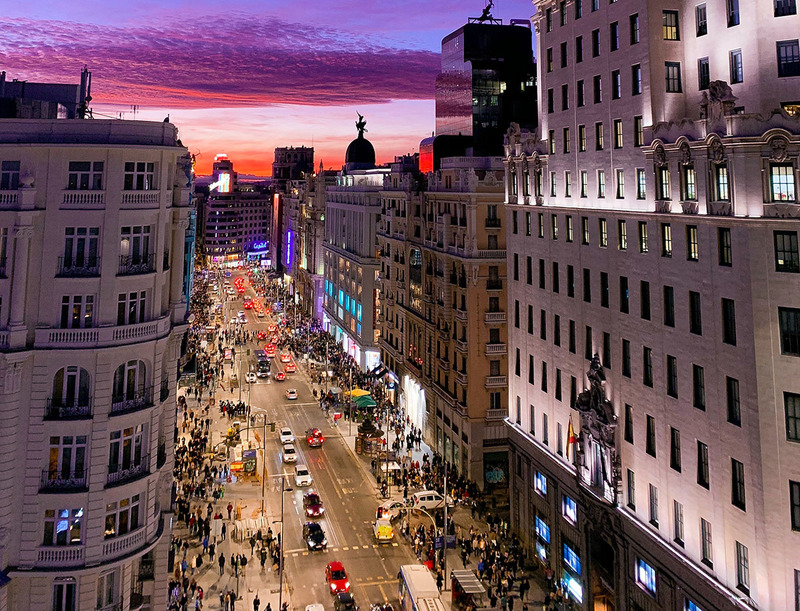 Public transport, taxis, and security and emergency services can also access Madrid Central freely, as well as hired private transport – Uber, Cabify – and car-sharing or moto-sharing vehicles. There are conditions on certain cases, such as people who work at night and cannot use public transport or distribution and commercial vehicles. For those who are NOT resident access to the centre depends on the type of car and it’s environmental sticker. There are no restrictions for the circulation vehicles labeled as 0 and Eco, and 0 vehicles can park in Regulated Parking Services (on street parking) with no limit but Eco vehicles can park for two hours during the times of regulated parking. On the other hand, B and C vehicles can only use car parks. Vehicles without environmental stickers will not be able to access Madrid Central. When does Madrid Central come into effect? 30th November 2018: start of Madrid Central in its informative phase, the rules will be applied gradually and there will be manual controls by police and mobility agents. January 2019: beginning of the two-month trial period of the electronic system for managing penalty fees – people will start being notified of committing an offence, without having to pay a fine. During 2019, restrictions will increase, extending to include vehicles which do not have the necessary environmental label. City Hall insists that access to Madrid Central is guaranteed without having to drive and will actually improve by using due to the public transport system: EMT buses, Metro lines and RENFE Cercanías and RENFE Media y Larga Distancia. There is also a public bike renting system, BiciMad, and a big taxi network. Peer-to-peer ride-sharing (such as Uber) is also allowed to enter Madrid Central, and there are various short-term rental services for bicycles, cars and motorcycles. If you are registered as a resident (empadronado) in the Madrid Centro zone and the car is in your name, there is nothing to worry about. However, you will need to get a permit if you want to enter with a rental car. All the information you need can be found on the Madrid City Hall’s website. The president of the Comunidad de Madrid, Ángel Garrido, has taken the initiative to court arguing that there are irregularities in the project, and that there hasn’t been enough investigation on other options to reduce pollution. The Tribunal Superior de Justicia de Madrid will have to decide upon the case hours before Madrid Central goes into effect. The public opinion, on the other hand, is split between those who see Madrid Central as a big step in the fight against environmental problems and those who believe the City Hall has gone too far. The most important issue seems to be whether the public transport system will be able to face the increase of demand that will probably take place as it comes into effect.